This email is destined for the trash folder the minute it arrives! If you are anything like me you will be fighting a constant battle with your inbox. The last thing you need is rubbish from someone you’ve never heard of, right! So this one was on its way to the trash folder until I decided that it warranted a place in my ‘Classic Marketing Mistakes’ swipe file. So let’s have a look at some of the things that are wrong with this email. The subject: ‘Training on Agile user stories’. I’m lost already. I have no idea what an Agile user is and I don’t understand why I should be interested in their stories. The only thing that this subject has going for it is that my ignorance caused me to be a little intrigued so I read on. 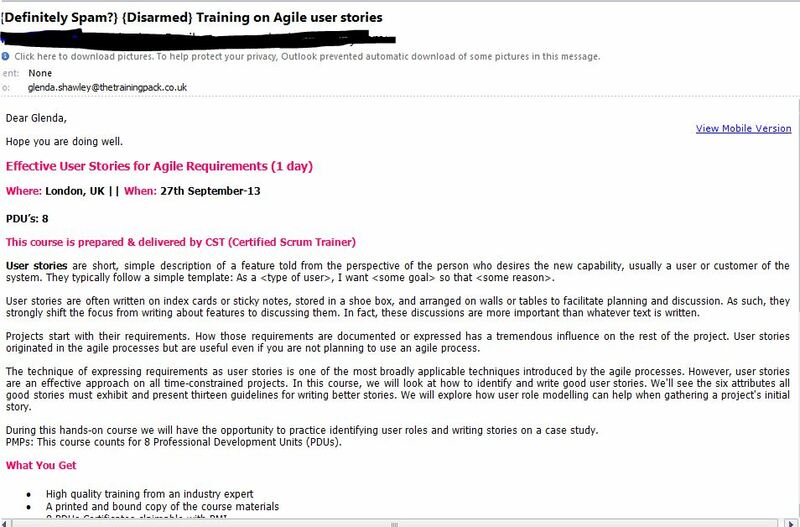 The headline: ‘Effective User Stories for Agile Requirements’ This is possibly even worse than the subject line. An agile requirement sounds like something I’ll need in the gym! Failure to qualify the target: There are five paragraphs explaining what user stories are but nothing to tell me why they might be important to me! When would someone need to develop a user story? What kind of people need them? Selling features not benefits: In the section headed ‘What you get’ there are four bullet points none of which answers the question ‘What’s in it for me?’ High quality training from an industry expert is a feature that I would expect if I paid £600 for a day’s training, it’s not a benefit. Telling me that people who have completed the course typically earn £1000 more per year than those who haven’t done the training would help sell the course to me. that your target audience will recognise themselves (it doesn’t matter if that loses you readers, you only need your target market to read your communication)? that your subject line or headline will entice your target to want to read on? that you have sold the benefits not just the features? In other words have you answered the ‘What’s in it for me?’ question? Have you given testimonials or guarantees to make the decision to buy easier? Do you have a strong call to action? Have you included an incentive to encourage your target to take the action you want them to take today? If you would like a second opinion on your draft copy email it to glenda.shawley@thetrainingpack.co.uk without any explanation but with the subject line ‘Marketing review’ and I will see how well it answers those five questions and then send you a short report explaining my views. This is a one off no charge offer available until August 15th 2013. This entry was posted in Communication, Marketing, Small business advice and tagged Agile, Computer-mediated communication, copywriting, Email marketing, Marketing, marketingmistakes, Open rate, Products, Scrum, User story by glendashawley. Bookmark the permalink.